In the field of medicine, there are a number of disciplines in which you could specialize. Studying the field of medicine can open up a number of career choices. Many would think that the prospects in this field are limited to doctors, physicians and surgeons. However, you could always find an option that relates to your personality, preferences, plans, and scope of qualifications. Pharmacy Techs are also members of a noble profession who receive numerous fruitful possibilities. In the professional world, Pharmacy Techs are required to fulfill a job description that mainly entails assisting licensed pharmacists. The process involves dispensing prescribed medicine. Their usual workplace is a hospital or a drugstore; however, they may even find jobs at grocery stores and departmental stores that have a medical counter or diagnostic centers. Pack, as well as label prescription medicine. Give medicines in accordance with the prescription provided by customers or directly by a health care expert. Ensure that the drug dosage and its proportion is in accordance to the prescribed dosage by the healthcare provider. Perform purchase transactions and charge customers. Follow through the necessary procedures for insurance claims by consumers. Report to the Pharmacist. Arrange for Pharmacist-Customer meetings when needed, to address any patient or client concerns, queries, etc. Perform day-to-day activities such as greeting customers, attending phone calls, maintaining customer records, etc. In the past, the U.S has shown significant growth trends for this occupation. It is anticipated that the future holds similar growth trends if not better ones. Factors such as job security and remuneration will depend heavily on the candidate’s profile. A small mistake by the pharmacy could lead to serious health risks for their consumers. For this reason, Pharmacy Technicians use detailed instructions from their supervising pharmacists. Due to this fact, the possibility of any mistakes in filling and following prescription orders is reduced. However, an important attribute for aspiring Pharmacy Techs is to have a personality type that allows greater attention to detail. At the same time, the interactive nature of this role requires that the candidate possess people skills such as customer service and support. These skills play a major role, as they minimize the chances of prescription errors. There are two primary organizations that provide a recognized certification in this field – the Pharmacy Technician Certification Board (PTCB) and the National Health-career Association (NHA). Their eligibility criterion may differ from one state to another. A high school diploma is one of the basic requirements; however, post-secondary education or a bachelor’s degree might open the doors to better growth opportunities in the field. The NHA is one of the largest allied health certification providers in the US. Many institutions offer NHA certification in various fields as a part of their program. The purpose of each certification is to ensure that students develop the necessary knowledge and skills so that they can apply for the most enriching job opportunities in their respective fields. Before you register for a Pharmacy Tech Certification program, it is necessary to take an exam known as ExCPT. Once taken, students must ensure that the program of their choice is recognized by NHA or PTCB. The National Commission for Certifying Agencies (NCCA) could offer significant help with this request. According to NHA, after completion of the certification program, candidates are eligible to work in pharmacies. They are also expected to work under the supervision of a licensed pharmacist. Other regular job duties include following the prescriptions that patients or their caretakers give. At times, these prescriptions may be received from authorized physicians through an email. Part of the pharmacy tech’s job is also to measure or weigh the prescribed drugs and even mix them if needed. All these duties are require performance under the directions of the supervisor. Process the Customers’ Insurance Claims. The main benefit of registering for a recognized certification program like that of the NHA is that it can be rewarding during the job hunt. Certified individuals have a strong and competitive edge over others. Secondly, there are many job opportunities in this field, which specifically require certified candidates. Accurate methods of identifying medicine. General pharmacy practices and policies. The validity period for the certification given to candidates by the PTCB is two years. After every two years, Pharmacy Techs are required to acquire recertification from the PTCB. The objective of the board is to ensure proper learning and pass candidates who have acquired exemplary techniques in the industry, or their field. Most employers in the U.S prefer to hire PTCB recognized professionals, as they are required to show better skills and knowledge than other candidates do. In addition, the individuals who are acknowledged by the board are ready to work in practical environments, and they do not need additional extensive on-the-job training. In order to be eligible to register for PTCB’s certification program, candidates are required to have a high school diploma. A similar degree would also suffice. In addition, the candidates are required to pass the PTCE exam prior to signing up. Moreover, students need to have a clean criminal record in order to be eligible. Once the applications have been submitted, PTCB reviews each one of them thoroughly. The test can be taken at any one of the Pearson Vue centers located across the US. Bear in mind, the PTCB is not responsible for providing training to candidates before the test. Many well-reputed training centers provide training for the test. The internet is also a great source for preparation. Even though employers have a high regard for PTCB’s certification, they will still require the Pharmacy Techs to apply for re-certification. In order to do so, applicants need to have 20 hours of continued education. This condition ensures that the Pharmacy Techs are in constant touch with their field. It also helps to strengthen their position. If a participant continues educating themselves on these issues and topics, they can be sure to have a shot of qualifying. Licensed physicians employ a large number of fresh pharmacy techs. Not only does this provide the new tech with a great opportunity, but it also provide on-the-job training. Although it is one of the greatest ways to gain practical experience, one cannot solely rely on it. It is always necessary to have a formal training and an academic background that backs up your position. At present, the growth trends in this field show increased competition in the near future. For this reason, aspiring candidates need to enroll in recognized programs immediately after completion of high school. Following the completion of core subjects, the program then advances into more areas. For instance, students of such training and education programs learn medication names and the impact of each of their usages, doses, reactions with other chemicals or medications, and so on. As mentioned earlier, a wise choice must be made when choosing an institution or an on-line platform to pursue Pharmacy Tech education. Besides a credible source of authentication such as PTCB or NHA, aspirants should review the complete program structure to make an informed decision. To sum up, the combination of formal education and training along with recognized certification is a great means to landing a good job opportunity with high potential of growth in the future. 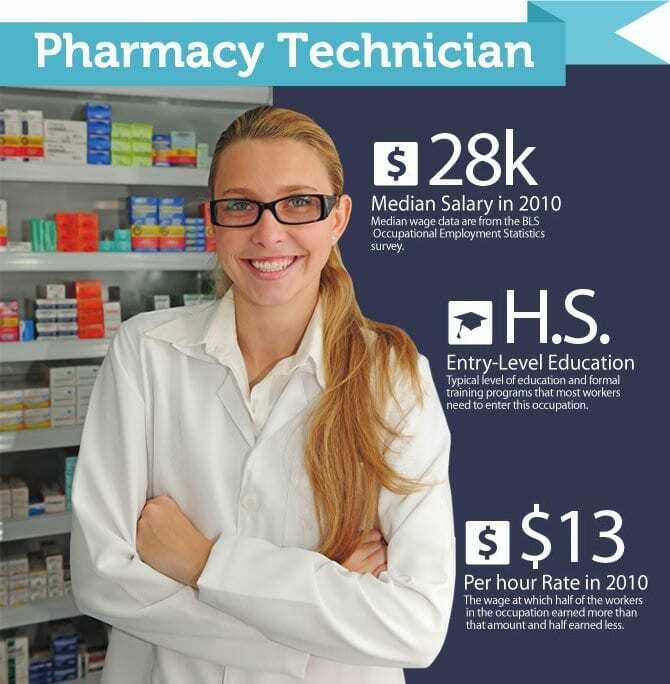 At the same time, certified Pharmacy Technicians are generally more fit to take up a job in the eyes of the potential employers and job interviewers. Overall, acquiring a certification in Pharmacy Tech speeds career start-up and influences greater growth.